One of the hardest things for many people to do is to bring themselves to a place of 'calm'. To be able to focus on what they are doing. 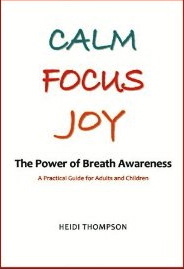 In her new book Calm Focus Joy: The Power of Breath Awareness, author Heidi Thompson outlines a program that she has designed to teach children how to use breath awareness as a technique to help transform themselves into a more calm, focused, happy person. Thompson's Mind Mastery Program developed out of years of working with children as a public education innovator in Canada, combined her 28 years of experience studying and teaching meditation techniques. In the book she outlines and explains ten breath awareness lessons that act as a "concentration strengthening exercises" that help develop mental facilities including memory, attention, perception, intuition, and intellect. As she explains breath awareness promotes brain development, physical health, and provides immediate and long-term relief from unhappy physiological, emotional, and psychological states. Thompson also points out that breath awareness is fundamental to just about every stress-reduction therapy and method, and it's value has been proven over and over by scientific research. I wanted to review this book after I read it because I felt that it is a very important, worthwhile book not only for parents of children who need to learn to focus and de-stress, but also for anyone who teaches or is in the helping professions. Unlike many books about various programs and methods, Calm Focus Joy was written in such a genuine and positive manner, it was a true pleasure to read. I found the factual information Thompson presents in Calm Focus Joy to be very interesting and she delivers it in a very non evasive, casual way. There are also several things in this book that sets it apart from other self help books that lay out various programs and methods. For example, I really liked the Teacher's Tips that Thompson included at the end of every step. Teacher's tips themselves are nothing new, but I enjoyed and appreciated Thompson's fresh and honest approach. I also found it wise that she included a short story within each step that could be read to the student to further illustrate the step's core essence. The approach Thompson used to provide basic information about child development and special needs issues is also woven throughout the book in a very low key, understandable way. All that said, what really struck me about Calm Focus Joy is that it goes one step further. As part of it's curricula Thompson's program encourages and teaches children to grow into wholesome human beings. Teaching kids basic core qualities such as 'I promise to Refrain from Hurtful Speech' and "I Promise to Speak Truthfully and to Act Honestly", build a strong basic foundation within an individual child from which awareness, growth, clarity and calm can then take root and grow. These basic principals of wholesomeness no doubt stem from Thompson's own years of Buddhist practice. They are very worthwhile principals to live by and are needed by not only children growing up in today's world, but adults too. Anyone who works with children in any capacity or has children of their own would benefit from reading this book. Calm Focus Joy: The Power of Breath Awareness is available through Amazon. Make sure to also check out our artist interview with Heidi Thompson.